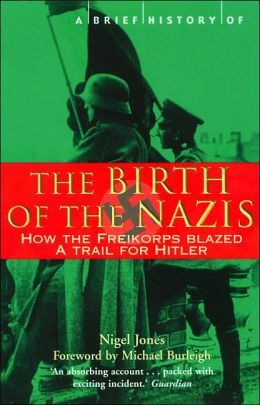 I was in Berlin when I read “The Birth of the Nazis, How the Freikorps blazed a trail for Hitler” by Nigel Jones (Robinson Press). Order had collapsed in Germany in 1919, after the end on the First World War. Imperial Germany had financed the Bolshevik take over in Russia in 1917, to get Russia out of the war, so Germany could concentrate on defeating the British and the French before the American troops arrived on the Western Front in large numbers. It had then imposed a humiliating peace on Russia, depriving it of a third of its territory. Now, in 1919, the boot was on the other foot. Germany itself had been defeated, forced to accept humiliating peace terms, and there was a real possibility of a Communist takeover in Germany itself. Germany had a proportionately much larger industrial working class than Russia and was therefore at a more suitable development stage for Communism, according to the Marxist dialectic. The German Army had lost the war, but it wanted the blame for the resultant peace terms to fall on civilian politicians. A Social Democrat led coalition government was formed which had the unenviable task of agreeing the Allied terms. The country was broke, and many people were starving. The Army tried to have it both ways. In the event of refusal to accept the Allied terms an Allied invasion was in immediate prospect. General Hindenburg advised the Government “We cannot count on repelling a determined attack by our enemies” but avoided the responsibility himself by saying. “ As a soldier, I would perish with honour rather than sign a humiliating peace”. This responsibility shifting technique of blaming politicians, while not facing up to military and fiscal realities, was common among many demobilised and underemployed soldiers, who were to form the nucleus of the Freikorps. It is a well developed technique for reality avoidance that we even see in our own enlightened times, on lesser issues! The Social Democrat led Government faced an even more immediate threat, an attempt to seize power, similar to that in Russia two years earlier, by a group calling for all power to be handed over to soldiers and workers councils on the Soviet model. There were mutinies in the armed forces and the elected Government lacked the means to assert its authority. So the Social Democrat led Government had to turn to irregular forces, drawn from people who had little sympathy with the Government, but who wanted, even more so, to prevent a Soviet style revolution. Thus the Freikorps were born. They succeeded, brutally, in their immediate task, and Germany enjoyed a democratic Government for ten years. But when the global depression came in 1930,Freikorps members provided a force that propelled the Nazis into power. This book gives a very good insight into two turbulent years of German history. It explains some of the present day antipathy between Social Democrats and Communists in Germany. It also throws light n the chaotic, violent, and unstable state of mind, brought about by the suffering and brutalisation imposed by Great War, that existed between 1919 and 1921 all over Europe, including in Ireland. WHEN THE MONEY RUNS OUT……The end of Western Affluence.